On to the business at hand. The aptly-named R2 Region features the marquee showdown between Star Wars and The Empire Strikes Back. In retrospect, when creating the scoring system for this bracket, I probably should have limited one entry per franchise, but it's too late now and this week we all have to choose between our two most famous children, and kill one. Sorry, everybody. In other news, Donnie Darko, which never should have made it past The Day the Earth Stood Still bit the dust, as did giant-killer Brazil. 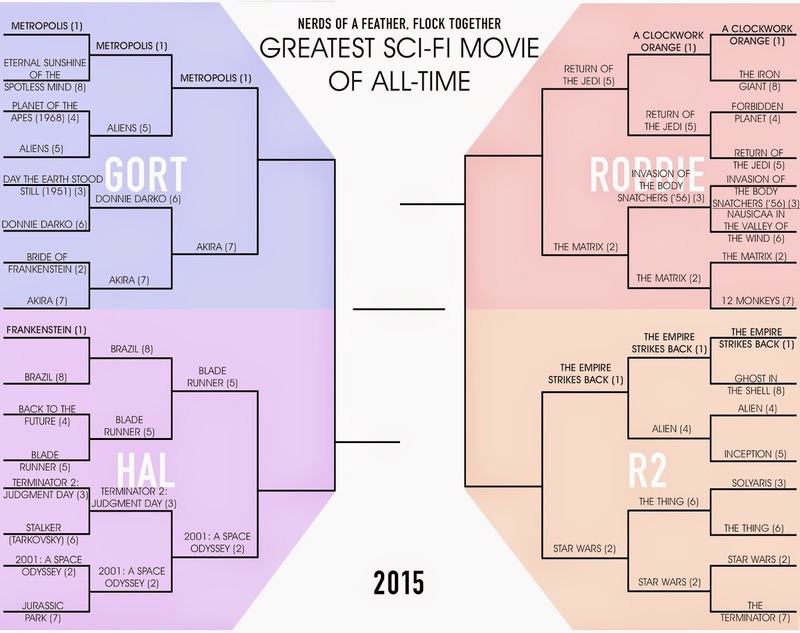 One-seeded sci-fi movie emeritus Metropolis justified it's original seeding, though, but sneaking past Aliens. Click for larger, printable view. Voting will remain open until April 9, and the next round will be posted next Friday morning. Happy voting! Posted by Vance K — resident cult film geek, champion of classic sci-fi, and co-editor of Nerds of a Feather since 2012.